As summer temperatures rise, dance teachers from all over the country may find themselves reaching for a sweater in over-air-conditioned hotel and convention center ballrooms, where an alphabet soup of teacher-training workshops—from DMA to DEA, NDEO to ABT—take place. The workshops are a popular source of inspiration, tools and technique for the coming year. Five years ago, Adrienne Clancy decided to create a more intimate version. Her Dance Educators Training Institute (DETI) attracts a collegial group of 45 to 50 participants, from students interested in teaching to newly minted teachers who just earned their BS degrees to those with decades of classroom experience. What sets DETI apart, says Clancy, who is artistic director of Maryland-based ClancyWorks Dance Company, is the credo: “We all learn from each other.” This think tank–like environment, where all the facilitators participate in the entire week, makes for a tightly knit learning community. Baltimore County Public Schools dance resource teacher Suzanne Henneman sends a group of dance and general education teachers to attend every year “to rejuvenate, to learn new information, to help stimulate their brains and bodies again,” she says. “Physically they learn new techniques and methodologies, and they network with each other and become part of the community.” Henneman says that with all their other obligations (fulfilling No Child Left Behind requirements, state testing, etc. ), it’s rare that teachers get to interact with the dance world and with one another. And DETI is known for creating and teaching useful methodologies, like K–5 arts integration, in which dance and academic lesson plans come together in public school classrooms. This year the weeklong institute, co-sponsored by Baltimore County Public Schools (which has worked with DETI since its inception), takes place August 1–5 on the campus of Towson University, outside of Baltimore. While many teachers are local, others come from around the country and the world. The workshops focus on four main tracks: composition/improvisation; curriculum designs and considerations; dance science/somatics; and techniques in modern, jazz, African and hip hop. Every attendee studies across all of these tracks. Each day begins with a technique class, before moving into a working session on composition and improvisation, which culminates at week’s end in an informal showing of choreography. The somatic track explores different methods to build and maintain healthy dancer, and teacher, bodies, while this year the afternoon is given over to hot topics, including lesson planning and assessment tools; arts integration in the public school classroom; and a participant-led dialogue, one of Clancy’s trademarks. “I want to help educators think more about how to see themselves as facilitators who help students challenge themselves on a creative level,” she says. Karen Kuebler, a dance and French teacher at École Primaire de Towson à l’Ouest, has attended DETI workshops to reinvigorate her teaching: “Whether it is a new idea on how to approach choreography, which I think DETI is very strong in, or a new way to approach your students, whenever you attend a workshop, you come out saying, 'I never thought of doing it that way.'" 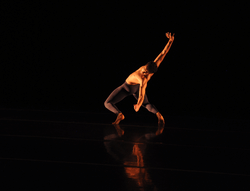 Lisa Traiger writes on dance from the Washington, DC, area.